An amazing opportunity to be inspired and learn three different techniques for making Banners for your Church. The workshop is suitable for experienced banner makers and people completely new to banner making. Techniques can be easily adapted for simple and complex banners. Ideas of how to make a collaborative banner which your whole Church can contribute to. Each of the three mini workshops lasts 20 minutes and will demonstrate the technique and involve a hands on practical element. The workshop is free to attend. We would appreciate it if you could email us by Wednesday 20th August to let us know if you want to attend so we can ensure we have enough materials for everyone. 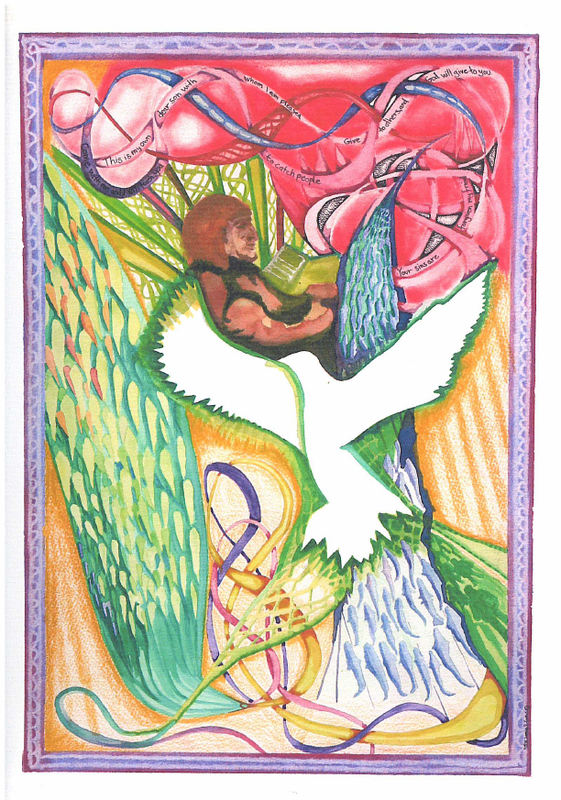 Local artist and former artist in residence at Art at the Chapel will be demonstrating his technique for creating huge banners from A4 images. His mini session includes how to incorporate Lindisfarne Celtic Knotwork designs into your banner and will give participants a chance to experiment with a wide variety of media including pastel pots and brusho. 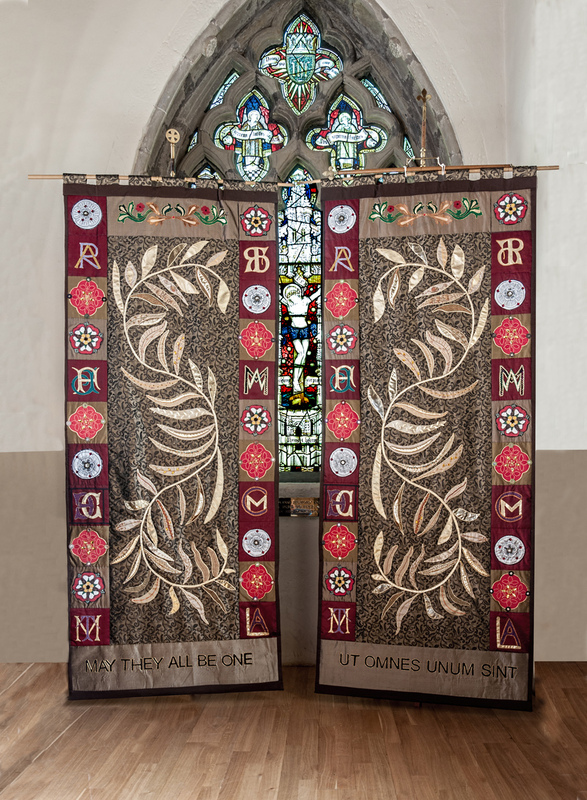 Banner designed by Ann Sharpe and made by Chris Watkins and other members of the East Leake banner group. Textile artist and a member of the East Leake Banner group, Chris has 19 years experience of teaching textile techniques at English Martyrs School and we are very excited that she will be sharing some of her fantastic knowledge and ideas with us. Her mini session will be looking at a variety of fabric based banner techniques from the simple to the exotic. 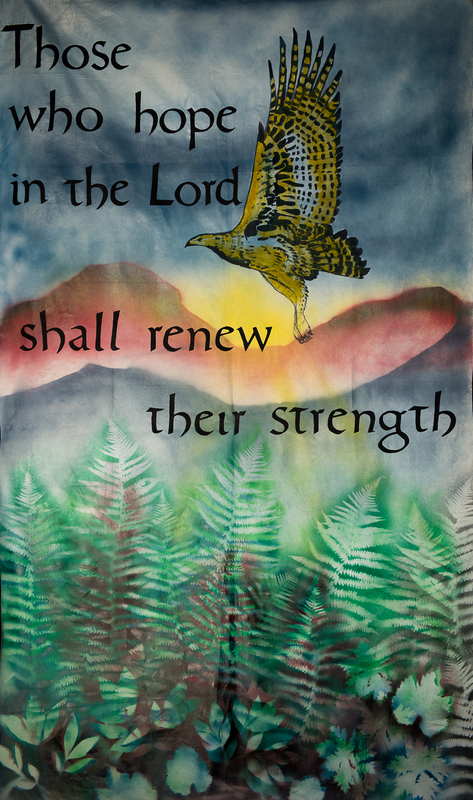 Chris loves working with fabric and banner making allows her to incorporate her faith into her work.